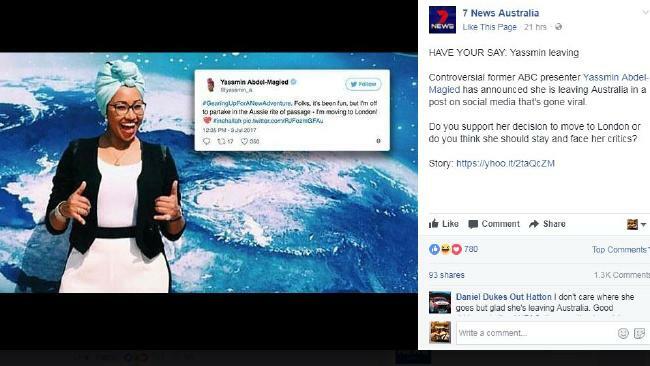 Channel Seven News has had to remove an online Facebook poll regarding controversial Muslim commentator Yassmin Abdel-Magied after it was branded as racist and hate-mongering. On Monday, Abdel-Magied announced that she was leaving Australia and relocating to London, saying she’d been “traumatised” by recent “deeply racist” criticism. Seven’s poll asked readers, “Do you support her decision to move to London or do you think she should stay and face her critics?” The post attracted more than 1600 (mostly unsavoury) comments and 17,500 votes. Before the poll was pulled, 15 per cent of respondents had voted “no” and 85 per cent has voted “yes”. However, the poll was quickly labelled as insensitive and bullying by many who suggested Seven was merely adding to the hatred against Abdel-Magied. Another added: “As a media outlet, you don’t think you have any ethical and professional responsibilities? Check out the comments below.” And another said: “FFS 7 news stop perpetuating hate for clicks! Abdel-Magied, a former ABC presenter, has often courted controversy with her divisive views and claims she is regularly the target for racism. She most notably put noses out of joint when she tweeted on Anzac Day that rather remember Australian servicemen on the hallowed day, instead we should “Lest we forget – Manus, Nauru, Syria, Palestine…”. She also attracted widespread criticism when she told ABC’S Q&A program that Islam was a very feminist religion. Many people believing her comments were out of touch with the majority of women living in Islamic countries.